ATTENTION SYDNEY FOODIES: Eat it. Seriously though. Eat it all – it’s winter and you’re allowed, we give you permission. In fact, barely even lift a finger to get the food. Let someone else cook it for you. Let them drive to a location near you. As the Coles ad goes – ‘Cook like a MasterChef cooks, shop where a MasterChef shops’ (Stone, C. 2013), but let’s take it one step further – how about we eat where a MasterChef eats? 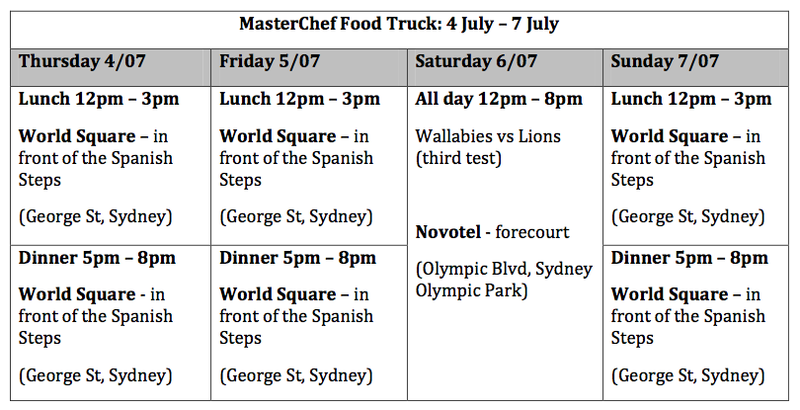 This Thursday, 4 July 2013, American’s will celebrate their independence with hotdogs, NASCAR’s and fireworks, but here in Sydney, we’re celebrating the opening of a 12 week rendezvous with the new MasterChef Food Truck. Correct. Two of our favourite powers are combining ala Captain Planet – MasterChef and the iconic Sydney Food Trucks. We know them well – Cantina Mobil, Veggie Patch Van, Agape Organic Food Truck etcetera, etcetera, etcetera – but it is our mates at Eat Art Truck that are taking on this 12 week gears and gobs challenge to feed the Sydney masses. “MasterChef Australia has always been on the cutting edge of culinary trends and there’s nothing hotter at the moment that Food Trucks. MasterChef changed the way Australians view food and it’s exciting that people will be able to buy the dishes they’ve loved seeing on the show,” says Margaret Bashfield, Executive Producer of MasterChef Australia. World Square, Overseas Passenger Terminal, Metcalfe Park, Barangaroo and Entertainment Centre in the Sydney CBD. For those of you with the the world (i.e. your beloved iPhone/Blackberry/Android) in the palm of your hands, they also have an App (available through www.sydneyfoodtrucks.com.au) that will adhere to your every stage-five-clinger girlfriend questions of ‘Where, what and why?’. However, if that is not enough, get onto their Twitter (@eatarttruck) and Facebook (facebook.com/eatarttruck) for all the daily details. Where is the MasterChef Food Truck? Week One Schedule. We can’t wait to hear from all of you about what you think of the MasterChef Food Truck over the coming weeks and look forward to hearing your best George, Gary and Matt impressions when you tell us how it is. Time to start lining up?